132 children among the dead in largest attack in years in the country, over 100 others wounded many with numerous gunshots. A bloody attack by Taliban terrorists on a Peshawar school in Pakistan on Tuesday left 141 people dead, 132 of them children and another nine staff members according to officials, in the largest attack in years in the country. Pakistani army spokesperson Asim Bajwa said in a news conference that seven Taliban terrorists committed the attack on Army Public School and Degree College, and that all seven wore bomb vests. Over 100 other people at the school were wounded, most of them children and many having been shot numerous times. 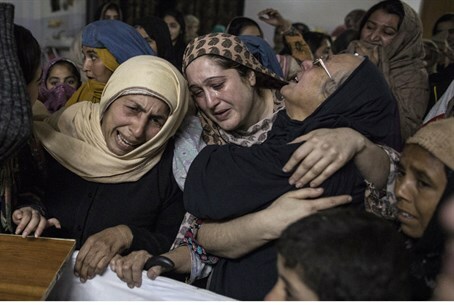 The attack started with a diversion as a car exploded behind the school, Pakistani education minister Muhammad Ur Rehman told CNN, adding "the security got their attention diverted (and) somehow they managed (to get) inside." After breaking into the school and going room by room gunning down children, the terrorists were finally stopped hours later by Pakistani soldiers who performed a sweep of the buildings, eventually succeeding in eliminating all of them. According to Pervez Khattak, chief minister of Khyber Pakhtunkhwa province of which Peshawar is the capital, most of those murdered in the attack were between the ages of 12 and 16. British Prime Minister David Cameron called the attack "deeply shocking," saying "it's horrifying that children are being killed simply for going to school." Pakistan had been holding reconciliation talks with the Pakistani Taliban up till last spring, with the country criticizing America for drone strikes on terrorists and warning they could upset the talks. Those talks have since gone south amid a string of Taliban attacks and pressure on the government to crack down on the terrorism. One of the most poignant attacks in early October saw a heroic schoolboy die as he tried to stop a suicide bomber on his way to attack the boy's school. His sacrifice prevented what could have been a mass casualty attack.